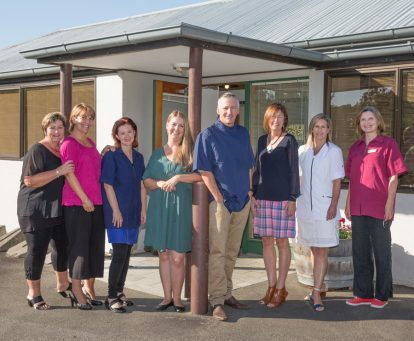 Welcome to Havelock North Dental Services Ltd.
Havelock North Dental Services is a dental practice with a big heart. For thirty years, Paul Scott has been caring for the oral health of the many people, who come through his door. He has a wide patient base, sometimes four generations of one family, and he’s a well-known face in the community. General dentistry involves the prevention, diagnosis and treatment of a wide variety of conditions, disorders and diseases affecting the teeth, gums and structure of the jaws and face. A crown is a type of dental restoration, which completely caps or encircles a tooth or dental restoration. Crowns are often needed when a large cavity threatens the ongoing health of a tooth. They are typically bonded to the tooth using a dental cement. Crowns can be made from many materials, which are usually fabricated using indirect methods. Crowns are often used to improve the strength or appearance of teeth. While inarguably beneficial to dental health, the procedure and materials can be relatively expensive. Cosmetic dentistry is dental work that improves the appearance of a person’s teeth, gums and/or bite. It primarily focuses on dental aesthetics in colour, position, shape, size, alignment and overall smile. We provide treatment for all age groups. Preschool and up to year 8 children can have free dental treatment if referred by the Dental Therapists under the special dental benefits scheme. Year 9-13 children enrolled under the Adolescent Oral Health scheme have free dental treatment until their 18th birthday..
Peter Foote was the first dentist to practice in Havelock North and he had his surgery at 9 Napier Road. He was a well-known and respected Havelock identity; a keen swimmer and skier and was generous in his hours of coaching at the local pool. He was instrumental in bringing fluoridated water to the Hastings district in the 1950’s. In 1984, he sold his practice to Paul Scott, the son of now retired Wellington dentist, John Scott. Paul was looking to settle in Havelock North with his wife, Hawkes Bay local, Mary-anne Watson. 9 Napier Road is now the ASB bank in Havelock North. In 1999 Paul Scott bought the physiotherapy rooms in Middle Road off Peggy Clayvanger and converted them into a dental surgery and he is still based there now. In 2004 dentist, Sarah Hall came to work with Paul and they have worked well together since then.